Last spring, I caused a near scandal in our small town when I tapped the birch tree in front of our new house. The locals scoffed, thinking I couldn’t tell the difference between a maple and a birch. My husband and I had to go down to the breakfast place to casually mention that I was brewing with it. Then all the oldtimers suddenly remembered their granddads used to make birch beer and birch wine, and suddenly everyone within many miles had heard about it. People I’d never met stopped by to ask how the wine was coming. It was crazy. What was just as crazy is how successful the recipe was. While it takes 30-40 gallons of maple sap to make a single gallon of syrup, it can take as many as 70-100 gallons of birch sap to make a single gallon of birch syrup. After about 4 months of fermenting, the wine at the time of bottling was hopefully tasty. By Thanksgiving, a few months later, it was fantastic. Flavorful, with a curious citric kick. It’s a little cloudy, but with a beautiful honey color, at 6% ABV. I got about a gallon of wine from this first round, but will definitely tap a few more trees this spring. Although the original recipe called for a few spices, I opted for a plain version first, but look forward to trying both soon. Update: I’ve made this wine again in spring of 2015, and I think it took me about 20 gallons to get enough sap for a 2 gallon batch of wine. A much better ratio than trying to make straight birch syrup! I suspect it’ll be up in the North of Westeros, where the forests are thick with trees, and anything that can be fermented, would be. Cook’s Notes: I can’t give you an exact figure for how much sap you’ll need for a gallon, but when I make this again this spring, I’ll update the recipe. In any case, you should aim for an Original Gravity of about 1.08. Combine all ingredients, shaking occasionally until the sugar has dissolved. Ferment until finished, then bottle. Yes, it was that simple. Use honey, pound for pound, and make it a mead! Is there a rough estimate of how much birch sap we need? A whole heck of a lot, but nowhere near as much as for a gallon of syrup. We are making birch sap honey mead with choke cherry mash. 20L birch sap, 4L honey, yeast and nutrients as well as some choke cherry mash left over from making jam. It’s been 42 days so far and smells amazing. It has a light pink tint from the choke cherries. We are also making Birch sap beverage for sale at local farmer’s markets. How do you measure the specific gravity of birch sap? Hey Margo. 🙂 I used a brewing hydrometer! Wow, does this sound good. I love birch beer, I just don’t get to have any very often. 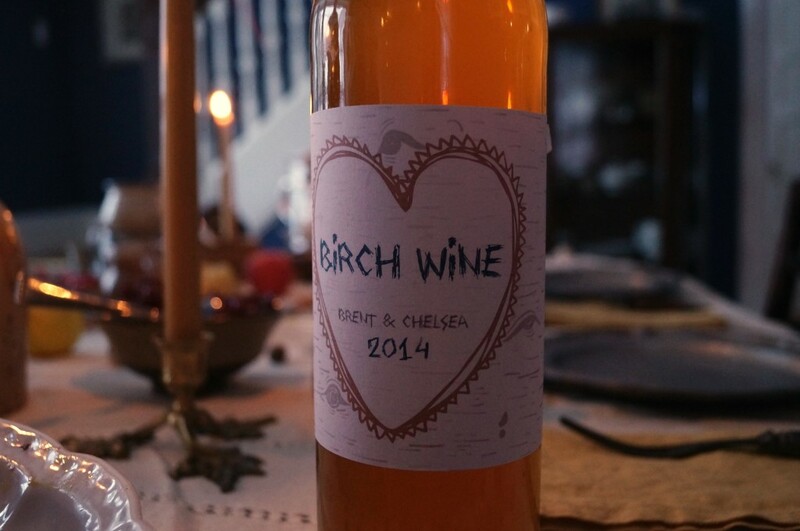 Never had birch wine, although this certainly sounds very, very good. How long time did you let it ferment? Too long? 😉 With both batches, I procrastinated when it came to bottling, but I’d guess 3-5 months.